Patrick Kupper, Bernhard Gissibl, and Sabine Höhler are the editors of Civilizing Nature, published in November 2012 by Berghahn Books. 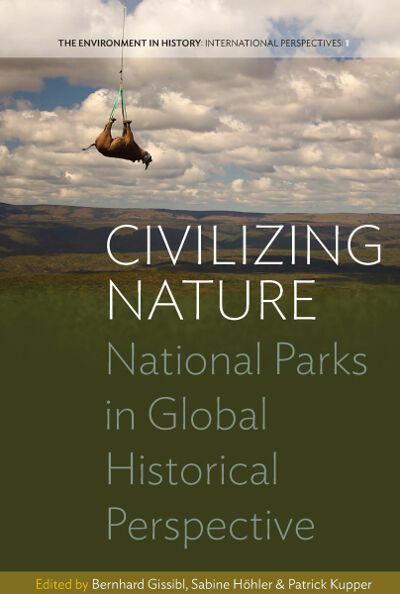 Civilizing Nature examines the phenomenon of the national park from a historical and transnational perspective. Why did you choose a global history approach to studying national parks? National parks have arguably been the most important tool of nature conservation worldwide. Since the first patches of nature were segregated under that label in the late 19th century, parks have become a global phenomenon – there are thousands of them all over the world, and they occupy an astonishing amount of terrestrial and, more recently, also maritime space. We found a paradoxical relationship between the national and the global in nature conservation, and the connections behind parks a striking and illustrative instance of what we have become accustomed to call globalization. Delving into this genuinely global history says a lot about the making and the nature of global environmentalism. How did you approach the topic? A central argument of the volume is that national parks are best understood as transnational parks. As charged with national significance as they have often been, they never emerged in the vacuum of a national container. The “national park” was a travelling concept, and park-making anywhere was enmeshed in processes of translation and borrowing, observation, learning, and the exchange of expertise and management practices that transcended boundaries. In the book we present case studies that are exemplary for the globalization of the national park concept. We did not aim at geographical comprehensiveness – this is not a handbook. Instead we asked our contributors to adopt a global perspective on their cases and localities in order to identify, as concretely as possible, the mechanics, actors and institutions that were instrumental in the transfer, implementation and adaptation of the national park concept. What do you mean by the title, “Civilizing Nature”? Our book is about the power of parks, less in their aesthetic or environmental allure, but in the political, social and cultural forces that produced them, and in the power that parks wield. The national park idea emerged in Western societies. It was deeply shaped by teleological assumptions of a civilizing process, which included the conviction of a temporal and spatial divide between Western development and allegedly more primitive states. Conservationists not only strove to safeguard the last patches of ‘unspoilt’ nature from the inevitable march of progress, but also took social relationships with nature as a yardstick of progress. While always contested within societies, parks were an expression of a particularly modern valuation of nature and they were impressed upon the world with almost missionary zeal. This is the one aspect of the title, the role of parks as a means of civilizing others. But “Civilizing Nature” must also be read in another way: Parks were also expected to exert an educative or ‘civilizing’ function through the recourse to nature they provided for modern societies. Both of these functions were predicated upon the fundamental separation of nature, usually understood as wilderness, from society and culture. This separation in turn facilitated the implementation of parks in national and imperial regimes of statehood. Is there something that a historical perspective can teach us for today’s practice of nature conservation? Yes, definitely. Today’s global situation can only be adequately understood in historical perspective. Although the increase of protected areas in both number and geographical extent has been staggering over the past few decades, conservationist circles are alarmed that all these areas are still not capable of preserving the world’s biodiversity. Fragmented geography and lack of coherence of protected areas is usually held responsible. Our case studies demonstrate that this fragmentation has grown out of the particular historical development of the past hundred and more years, in which bounded and nationalized nature became the trademark of conservation. The contributions to our volume show indeed that the much-deplored lack of ecological interconnectivity in today’s global landscape of conservation results from the peculiar political, cultural and social conditions and connections that moulded the national park idea since the late nineteenth century. The patchy global geography of conservation is a consequence of the very malleability and adaptability that characterized and actually enabled the global spread of the national park. What aspect of compiling an edited collection did you find most challenging? Most rewarding? It was challenging to select contributions for such a volume, especially since we aimed to take a global historical perspective. As mentioned above, the idea to cover all world regions was impossible to meet in a single volume. We had to find a middle ground between geographical inclusiveness on the one hand and historical focus and concentration on the other, and we did so by selecting exemplary regions and historical instances. Most rewarding certainly was the work with an interdisciplinary group of authors from several continents. We have shared and revised thoughts and ideas with them over a long time period. It was in the close collaboration with the contributors that case studies developed into a coherent structure of a book that tells the temporal as well as the spatial story of the national park idea since the later nineteenth century. Without their enduring commitment and enthusiasm this endeavor would have been impossible to undertake, and it is to our authors that our greatest thanks go. Bernhard Gissibl, Dr. phil., is Postdoctoral Researcher at the Leibniz-Institute of European History in Mainz. His PhD dissertation explored the history of hunting and wildlife conservation in colonial Tanzania. Sabine Höhler is Associate Professor of Science and Technology Studies at the Royal Institute of Technology in Stockholm. Her recent study on “Spaceship Earth” explores global concepts of environmental carrying capacity and life support between 1960 and 1990. Patrick Kupper is Senior Lecturer at ETH Zurich. His most recent book, published in 2012, is a transnational history of the Swiss National Park.